Now I can't explain why but I can find no pictures of me doing any fishing or posing with any fish. I really don't know why as I went fish'n almost every chance I got from the time I was a kid until just the last 4-5 years. The only picture I have been able to produce to date is the one used in the upper right and left corners of this page. I took several pictures of other folks fish'n and so forth, but I don't believe I was the object of any photographers. This being the case, I am relying on the good judgment of my friends and relatives in the matter of veracity for any statements which I might make in these stories. We'll keep adding to these stories as we go along so check back when you're of a mind to hear a fish'n story. Now, one time down in Exline Iowa, my brother John was out bass fish'n as he quite often was wont to do and he came to my home with this big bass. Not knowing exactly what to do with it as he had all the fish he needed already, he brought the mess of fish to our house there in Exline. There was one fish, a largemouth bass, in the bag that was really nice, about a 5-6 pounder I'd say. John always was rough on those bass. As nearly as I can remember, since this was way before we acquired this computer, it was a nice healthy fish and and provided my family with a nice meal. We ate a lot of fish when I was younger and doing a lot of fishing. I just loved the deep-fried crappie, bass and walleye fillets which wife served with potato salad and a few other items like home made whole wheat buns or sliced bread loaf all washed down with good, cold, iced tea, sweetened, of course. Ahhh boy, ah'm gonna have to get the rod out and hit the fish'n hole, I can see that right now! That John is quite the fisherman, actually all of my brothers were. The three of us who fished had fish'n license in our pockets for several different states at any one time. We generally fished in the states adjoining Iowa but made trips to other states as well, mostly in the Mississippi drainage area although one brother did go up to the Red River which drains north and fish for catfish. We've fished Canada for lake trout, walleye, Alaska for salmon, and Caribbean for red snapper as well. 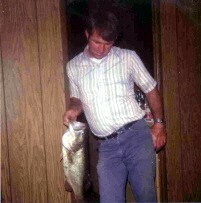 My father liked to fish for trout in the small streams and rivers in Iowa, Missouri. But he preferred fishing for channel catfish in local river. John, who was a truck driver, had a horrific truck accident in 1998 and had both legs crushed as well as other broken bones and injuries and his recuperation has been terribly slow. The long recuperation from his injuries just seemed to whet his appetite for the sport. He was out fishing before the bone of one leg had completely mended. In effect, the leg is still "broken" and his doctor instructed him to walk as much as he could as they thought it would help the bone mend with no cast, just a brace. 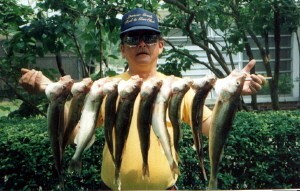 Well, being a real, bonifide, first-line enthusiast of the fish'n sport, John didn't have to have the suggestion made twice and he started hitting some of his old "hot spots" and the fish in the photo is what Longbranch Lake in Macon Missouri yielded up. 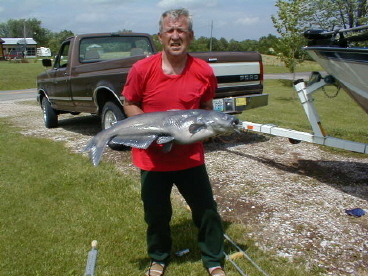 You can see his crutches, which are never far from him anymore, lying on the ground at his feet and John is not exactly pain free as you can see by the expression on his face, but there he stands with his trophy blue catfish. I just had to tell this story to demonstrate some people's desire and regard for the sport of Rod/Reel Fishing, any kind of fish. Now here's a fellow from Michigan who says he really likes to fish for walleye and that there's nothing to it if you're up on it and have a good fishn' partner. This is Art Sehnke's story which the editorial staff of this here web page's fishn' section has no reason to disbelieve it. Art related this story to the staff and backed it up with these here photos which fish he has declared truthfully to be his own. Art was telling his working buddy Ron about this big 8# walleye he caught and took home, and Ron asked if he mounted it but Art said no he had cleaned and cooked it but it didn't taste so good 'cause it was so big and old. One thing leads to another and Ron starts bringing in pictures to show to Art. Now Art says that every Monday morning, his good buddy would bring in these photos of fish he had caught over the weekend; small mouth bass, next week walleyes, next week muskies and says Ron is the best fisherman he EVER knew. 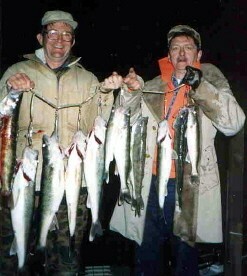 Finally, about April 5, 1990 Ron says, "Art, ya wanta catch some walleyes?" Art says, "Do I, dooo I?!!" Whereupon Ron tells Art to bring his rod to work and when they get off, follow him home and they'll catch some. So Art follows him home, they launch the boat and cross the Detroit River and jig with 5/8 oz chartreuse plastic skirted jigs in 8 ft of water and catch 3 fish, the largest 8 lbs and is 27 1/2"!! Hey Art, that IS fishing! But Art continues his narrative with ......... A week later, he takes me to the Canadian side, we fish 2 hours and land 16 walleyes! There were Canadian fishermen drifting right besides them and Art, Ron were culling out the walleyes they didn't want ...... THROWING BACK THE 5+ POUNDERS and keeping the 2-3 pounders "cuz they taste better!" When I was a kid, the postmaster of our town was named George McClasky and he had 2 children one of which was a boy named Tom. Now, Tom McClasky was about 10 years older than me and a lot ornerier. Tom went into the Army like a lot of young men around here, liked it and made a career of it. He married a German woman and when he retired as a Master Sergeant, took up residence in Germany. Well, Tom's father George, being aged, became ill and was not expected to be with us much longer so Tom came back to spend some time with him before he passed on. While Tom was here (they lived just 3-4 houses west of my father) he reacquainted himself with my father and said he'd like to go fishing. I suppose having seen us go a few times, he knew we fished. So my father got him fixed up with a rod/reel and they went a time or two. Pretty soon, every evening when he figured we'd be going fishing in some pond around there, here would come Tom all ready to go, invited or uninvited. But we went all the time so had plenty of room to accommodate him. We enjoyed his company, as a matter of fact. So, we had gone out late one afternoon and got a few bass about the right size, 1-2 lbs and we brought them home and showed Tom how to clean his fish and he said he liked to eat fish and wanted to know how to cook them. We were setting in lawn chairs in the front yard and my mother, the cook, just happened to be right there and explained to Tom the different ways she had cooked fish; fried, baked, broiled, etc and told Tom we had even taken the fish and put butter, onion rings, salt, pepper on them wrapped them in foil and did them in the oven. Tom never heard of that and wanted to know what to put on them exactly and mom was trying to tell him to use his judgment, he could put almost anything on there he wanted, sliced tomato or anything, whatever suited his taste. Next afternoon, here comes Tom, right on time, and my father, who is fairly ornery himself asks him, "Tom, did you cook the fish?" "Oh my, yes, cooked'm in the foil. Those were the best fish I believe I EVER ate!!" "Whata ya mean, all that stuff?" "Why, everything you guys told me and boy was they good!" I couldn't help myself and busted out laughing but my father did a little better job, not laughing outright anyway and told him he wasn't supposed to put all of that stuff on there, that those were merely things he "could" put on there. Tom had put everything we had mentioned, whatever he had in their kitchen, on the fish. Its hard telling what he put on them and if it were so, he would never have been able to duplicate it later, I don't imagine. When thinking of Tom, I've often wondered if he was just yanking our chain. He were ornery enough. Tom returned to Germany and it was no time before George passed away. And in a couple years we received word that Tom had also passed away in Germany, which was a surprise to all of us and as far as we know he was buried there in about 1973. But he sure did like to fish and liked to eat'm, too. So, like I was saying ...... I somehow managed to go through my lifetime fish'n all over the place and never got a picture of me with a fish. My son Sam's been hitting the fish'n hole up at Rathbun where I started taking him when he was about 3-4 years old. Sam was a steady fisherman even when just a little feller- seldom got real excited and would sit right there and fish hard - something kids, including me when I was a kid, find hard to do. Anyway, Sam's older now, has his own family and equipment and is starting to go fishing again. I gave him all the pointers I could about Rathbun and he's gone there a couple times this week as he took some vacation just to go fish'n and he just came home with a nice little mess of fish. Not a big mess but would make 2-3 nice meals for him and his wife. He's all excited and was getting ready to 'clean' fish when I tells him, "Whoa, there Sam. I've been putting this web page together and do you know what? I can't find any pictures of me with any fish, not even one!" and I suggested he take my camera and get his picture taken with his mess of fish so he'd have something down the road and not do as I did. Sam did, posing with his fish and Dan, his brother, doing the 'photog' work and here is the picture ...... so that will be the beginning of Sam's fish'n picture album-he'll have at least one photo! Seems like the photographer had a little problem with a feature of the picture on the left but that's OK, all three subjects in the photo are fine looking specimens of the sport ....... man, fish, background. This a good photo of fishn Helgas B&B, Seafish Charters in Sitka, Alaska. This photo was sent to me by Joe Garrison who is the owner/operator of the sporting enterprise. 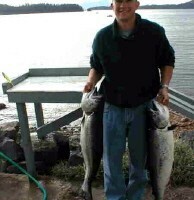 He reports the salmon fishing is great and says that he one time had his relatives from Germany over for a visit and when they were out in the bay there, a pod of about 30 whales came in and he got his boat with the people right into the middle of things which made for a little momentary excitement. When I saw the whales up by Seward, Alaska any kind of distance was OK by me, too. Guess I'm just not friendly with whales, either. Man, they're ...................... BIG. 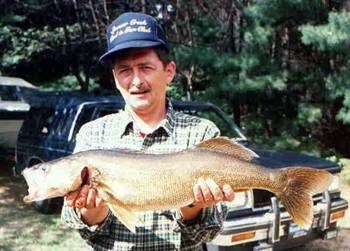 Art Sehnke says he caught this walleye (details later maybe) and it is the largest one that he has caught. He reported that he dressed it out and ate it but thought is wasn't as good as the smaller ones. 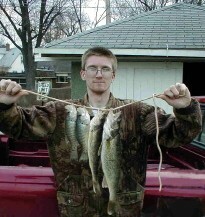 He said he caught it in open water on the lake where the fish have plenty of room to move around and are generally more slender than those caught in restricted waters. He had another walleye caught at different time and place which weighed the same but was 1 1/2 - 2 inches shorter. I know that, in his later years especially, my father always kept the younger fish for food as they were better eating. 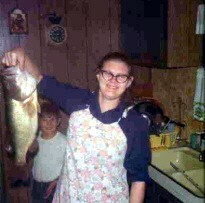 But as we had a pretty good sized family, we were not prone to not use a really nice looking fish like this one. 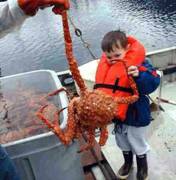 Now here is a little fellow that is, I believe, shopping for Alaskan King Crab and it looks like he's got a winner. Having never actually seen one, its hard for me to believe that the crab is bigger than he is. He sure does not seem to be afraid of it. 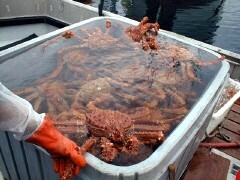 Joe Garrison of Sitka has dutifully reported that he was not "fishn" for crab, just came home with it. Joe sent me these great photos of his Grandson Ray helping him with the crab selection. Joe tells me that he used to put out the crab pots for a few crab for himself and friends. Kind of interesting in that he says you should put the pots right on a ledge if possible and he was telling how deep he was putting them, 700 ft I believe, and boy that's pretty deep especially for us Iowa farm boys who only occasionally fished water over maybe 50 ft deep. It was a lot of work hauling them up and what not by hand but Joe says he couldn't justify expense of mechanized equipment for just personal use so quit the potting(?) and started buying the kings at the local market. Interesting.